Yesterday, there was a pace car crash. The second race of the Chevrolet Dual in Detroit was delayed for 30 minutes as the pace car found the retaining barrier before the race even started. 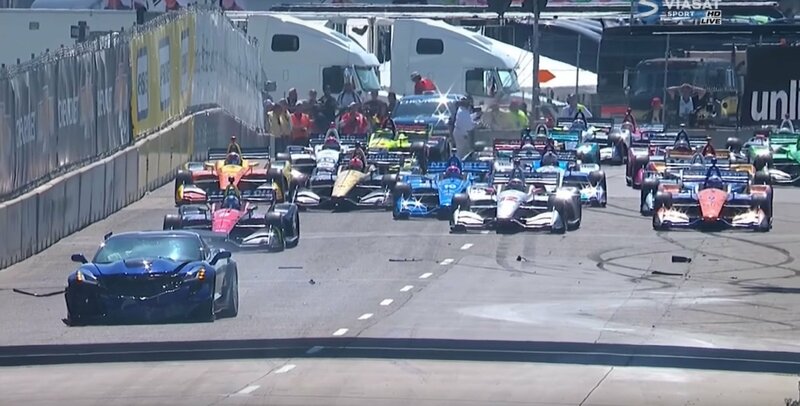 Watch the Indycar pace car crash video below. In this situation, the Chevrolet Corvette was being driven by one of Chevrolet’s own, Mark Reuss. He’s the executive vice president, global product development, purchasing and supply chain for the General Motors Company. From 2009 to 2013 he served as the President of General Motors North America. Reuss is licensed for FIA C and IMSA Road Racing. He was also ‘instrumental’ in bringing the Chevrolet Detroit Grand Prix back to Detroit’s Belle Isle Park. Reuss lit up the tires off turn 2. At the sam time, there’s a bit of elevation there as well. The car got light, the back end stepped out and it was over from there. Reuss was still on the gas as the pace car did a 180 spin off the corner. He hit the wall with the front end, bounced off and the car completed the 360. To their surprise, race cars came around the corner to see the pace car crashed and parked in the center of the track. Alexander Rossi was the only driver to move around the accident. Every other track stopped on the track to avoid any possible punctures just ahead of the green flag. Reuss was taken to the infied care center for evaluation. He was recently without injury. Oriol Servia was selected as the backup pace car driver. Servia served that duty via a backup pace car. He’s run 1 Indycar race in 2018. “We are thankful that there were no serious injuries,” Chevrolet said in a statement. “Both the pace car driver and the series official were taken to the infield care center, where they were checked, cleared and released. Ryan Hunter-Reay went on to win the Verizon Indycar Series event. Indy 500 winner Will Power finished in 2nd.